This intense variation on the historical biopic offers more grit and offbeat flourishes than one might expect from this kind of film. The story it tells works both as an outlaw-as-antihero story and also as an indictment of Australian colonialism (fittingly, the hero's partner in crime is the most dispossessed of Australians, an Aborigine). The narrative is told in a punchy style, with lots of events rolling out in machine gun style, as Morgan goes from iconoclast to wanted man. Director Philippe Mora gives the often violent storyline a tremendous sense of stylistic drive, piling on swooping camerawork by cinematographer Mike Molloy and a haunting musical score by Patrick Flynn that mixes choral and Aboriginal motifs to otherworldly effect. That said, the beating heart of Mad Dog Morgan is the all-stops-out lead performance from Dennis Hopper as the title character: he sustains a burning intensity from start to finish and his willingness to go out on a limb and drain every last drop of emotion from the role is the engine that drives the film. Also worthy of note are David Gulpilil, whose quietly charismatic turn as Morgan's partner acts as a counterbalance to Hopper's furious theatrics, and an ominous, darkly witty turn by Frank Thring as the government man determined to take Morgan down. 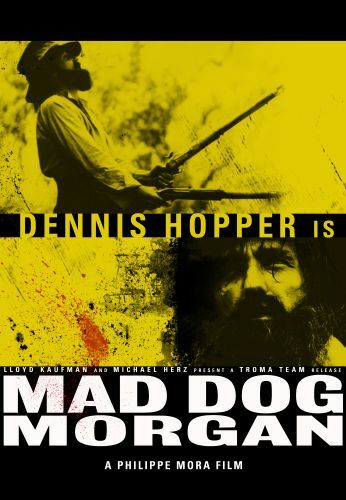 In closing, Mad Dog Morgan is an intense, sometimes brutal experience but it also offers plenty of food for thought and a stunning example of cinematic craft. As such, it is well worth a look for the adventurous cult-film fan.